Skepticism and analysis surround every team as the second week of the season comes to an end. I guess I’m here to join the party–mainly for analysis, not for skepticism. It’s easy to analyze halfway through the season, but only two weeks into the season seems a little rash, doesn’t it? Is it appropriate to analyze, criticize, and skepticize (yes, made up word) already? I don’t know the answer, but I think it’s appropriate to offer some analysis because the Red Sox have made some easily preventable mistakes that have led to run scoring. And even though it’s early on, there are some serious, and unfortunately controversial issues that need to be addressed. It may be the beginning of the season, but every game counts. These games count as much as they do in September. Each game is of vital importance as each team tries to avoid the obstacles on the road to the postseason. I don’t agree with those who say, “It’s the beginning of the season, they’re just adjusting.” That’s what Spring Training is for. 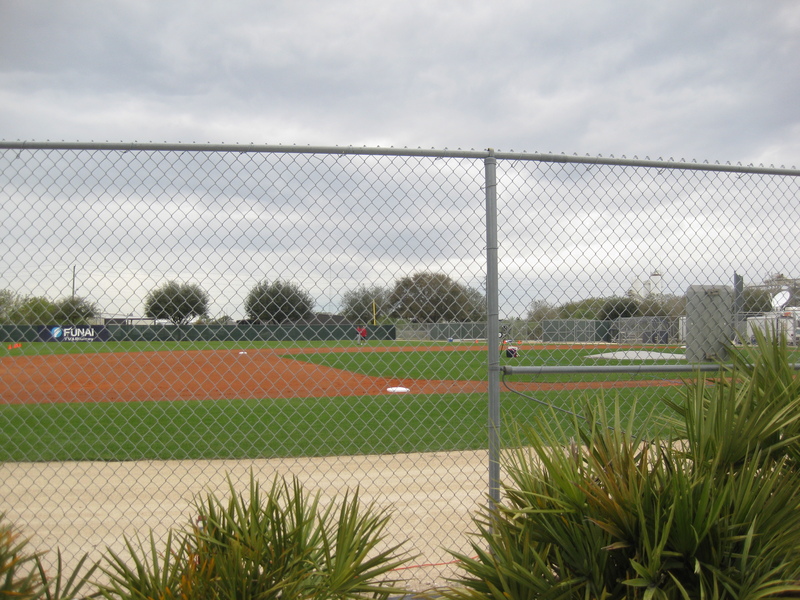 Ideally, teams should work out their kinks during Spring Training. Inevitably, obstacles will arise during the regular season, so I’m here to try and work those out. 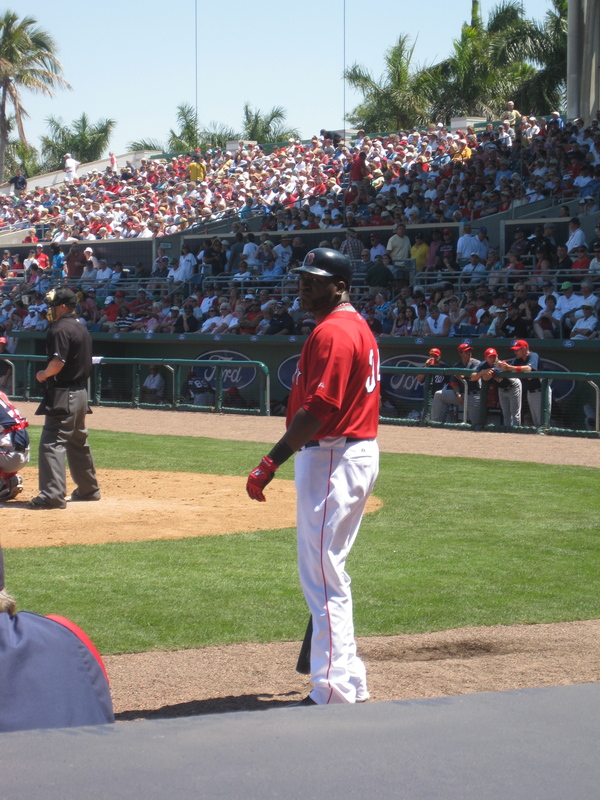 Let’s tackle the obvious topic first: David Ortiz. I think he has felt under pressure to perform since the first game of the season. Because of the dismal numbers he put up last season, all reporters ever asked him about during the Spring was his rebound. It is easy to tell how insecure about this situation he is. He snapped at reporters the second day of the season; he got ejected from a game for arguing about a strike; and it is easy to spot the frustrated grimace on his face each time he strikes out. I don’t blame him for feeling pressure, but I’m surprised about how much it’s getting to him. I won’t ignore the few hits that he has gotten: some have been solid contact, but others were pure luck. He even picked up the golden sombrero one game where he struck out four times: that’s the problem. He strikes out, and for the most time, he strikes out looking. I’m no hitting guru, so I’m not here to talk mechanics. The fact of the matter is that having him in our lineup is ineffective, and at times, detrimental. So why does Terry Francona put him in the lineup day after day? I think that part of it comes from seniority. Maybe Terry Francona thinks that maybe Big Papi is just going to get out of his funk because of what he has done in the past. But this is the third year in a row that this has been going on. As much as it pains me to say this, he is done. I’m sure it will be tough to sit him, but it is necessary. It is important to put the best lineup out there, and putting Big Papi in there does not get the job done. I like the idea of platooning Mike Lowell and Jeremy Hermida at that spot. Hermida has proved himself to be a fantastic pickup coming off the bench for Jacoby Ellsbury while he is injured. I can see him hitting a lot of doubles off the Green Monster. Issue number two: The Bullpen. Last year, the bullpen was considered our strongest asset. This year, it has been one of the weakest. I don’t think that the loss of Takashi Saito or Billy Wagner really affects that; however, the loss of Justin Masterson does. I’m sure you all know exactly what I’m going to say. Bring up Michael Bowden! We need a long-term middle relief pitcher; especially if our starters are done after the fifth inning because they throw 30 pitches in an inning or two. The Red Sox obviously expect to use him as a middle reliever, so what I don’t understand is why they’re still treating him as a starter in Pawtucket. I think that for a pitcher to be completely effective, they have to know their role (no matter how good they are). Just look how good Justin Masterson is doing with Cleveland now that they have explicitly deemed him a starter. I have no doubt that Bowden has the ability to flourish in either role, but he will be more effective once they tell him what his role actually is so that he doesn’t have to keep switching. Ramon Ramirez has been struggling so far, so I really hope that he finds his stuff because he was the unsung hero of last year. Manny Delcarmen still struggles to be consistent, but he has the ability to go multiple innings, which is important. I prefer him over Scott Atchinson anyway. I think that Robert Manuel, now pitching in Pawtucket, could be really effective in the bullpen if he was given a chance. I know Daniel Bard is very good, but the Red Sox need to use him a little more sparingly. The poor guy has been used so much already this season. He has a wicked slider, but I’d like to see him add a changeup to his repertoire because the radar gun is almost always 90 mph or above, and having that speed constantly will almost surely lead to giving up more home runs. My final issue with the bullpen includes Victor Martinez as well. When it comes to Jonathan Papelbon, all he ever calls are fastballs. Papelbon also has a slider and a changeup in his arsenal, so I think that it’s important that he incorporates those as well to avoid meltdowns. I’m sure you all remember his most infamous blown save, and all Victor Martinez called was fastball, after, fastball, after fastball. Neither Victor Martinez nor Jason Varitek have the ability to throw runners out, and every team knows it. Victor obviously needs to work on his mechanics considering all of his throws are high and to the right. This could create a serious problem. First of all, because the runners can steal so easily, the possibility of inning ending double plays are eliminated, which means that our pitchers will have to work longer, and that we might have to use our bullpen earlier. Also, pitching from the stretch is a tough thing for lots of pitchers. I especially noticed that with Clay Buchholz during the Spring, and even he has admitted that it’s something he needs to work on. The pitchers obviously don’t want the runners to steal, so they might feel added pressure to get the ball to the plate quicker. This situation could have disastrous consequences. It is important that the pitchers don’t think about anything but hitting their spots. If this becomes a serious problem, the Red Sox do have some catching talent in the minors (with arms) in both Mark Wagner and Luis Exposito. Luis is definitely someone to get excited about, but he still needs some seasoning. Mark Wagner, on the other hand, is in Pawtucket, and I think he is ready to go. Some bats have been quiet (Big Papi), some have been loud (Dustin Pedroia), but the Red Sox have left so many runners on, but I think there is an easy solution that Terry Francona hasn’t seen yet because he is an American League manager: small ball. Because the Red Sox focused on improving defense during the offseason, they aren’t full of the 30-40 HR power bats. However, that’s not to say that they aren’t offensively sophisticated. They have the ability to score a lot of runs this season, but it won’t come from lots of long balls. Rarely, if ever, do you see the Red Sox lay down a solid bunt. Perhaps the Red Sox wouldn’t leave as many runners on if they started sacrificially advancing runners more often. I LOVE this kind of baseball; I find it to be the most exciting, and I think that it is a method that the Red Sox must begin to incorporate. Those are the biggest issues that I see so far. The defense hasn’t been as spotless as expected, but I think that these acquisitions will pay off in the long run (despite some costly errors early on). Perhaps they’re still adjusting the the eccentricities of Fenway. It’s the big errors that stand out, not the rest of the times that they make the often spectacular play. The last issue I notice (though it hasn’t made much of a signifiant impact) is that sometimes, Adrian Beltre simply swings at terrible pitches. He has been hitting really well thus far though, so I’m not complaining yet. -Dustin Pedroia is off to a monstrous start. Contrary to popular belief, he can hit the high inside fastball! -Jeremy Hermida has been an extremely valuable asset off the bench. I think he will flourish in Fenway Park. -Daniel Bard has been a workhorse. -Josh Beckett’s 75 mph curveball his a thing of beauty. I’m so glad we signed him to a 4 year deal. -Jacoby Ellsbury was really catching on fire before that unfortunate collision between him and Beltre that has sidelined him since. I really hope that he heals soon, because I really like having him in the leadoff spot. I may be skeptical, but I’m a true believer in this Red Sox squad. One more thing before I settle down to watch the final game of what has been a frustrating series against the Rays so far. Ubaldo Jimenez threw the first no-hitter of the 2010 MLB season, and the first in Rockies history. Thanks to the twittersphere, I was clued in, and I was able to watch the final three outs of the bottom of the ninth inning. Of course, MLBTV froze up right as Brian McCann hit the ball to second, but I heard it, and that’s just as special. He has been compared to Pedro Martinez, and considering the velocity he had on his fastball so late into the game (and after so many pitches), I have no doubt. As I watched the bottom of the ninth inning, I could feel my heart beating quicker with each out, and my hands shaking more and more before each pitch was thrown. 32 autographs and Spring Training games haven’t even started yet; I guess I’ve gotten kind of good at this. You guys know how I got six of them, but here is a refresher if you need one. Tonight, I will share with you the stories behind the other 26 autographs. 20 of them occurred today at the Players’ Development Complex, and five occurred quite unexpectedly (I think I’ll share those on another day though). Today was probably the most fantastic, unforgettable day of my life. There was supposedly an open house at City of Palms Park, with family events, tours, and autographs. As many of you can probably guess, the latter was my inspiration. I didn’t really know what to expect at this event, especially with the autographs situation. Were the players really going to take an entire day off just to sign autographs for the fans? The answer was no, so it was a good thing that my father and I arrived early. There were lots of big buses around the stadium that were shuttling fans to and from the Players’ Development Complex right down the street. I had never been there before considering parking is absolutely forbidden, and I didn’t really know what exactly went on around there. I had never been to a workout before; in the past, I had only gone to games. Hopefully this will become a yearly ritual though because the workouts are almost as fun as the games. The emotions I’m feeling right now can’t be put into words: I’m on cloud nine. So I’ll just take you through my day, and hopefully, you can live vicariously through me, and experience the kind of elation that I feel right now. 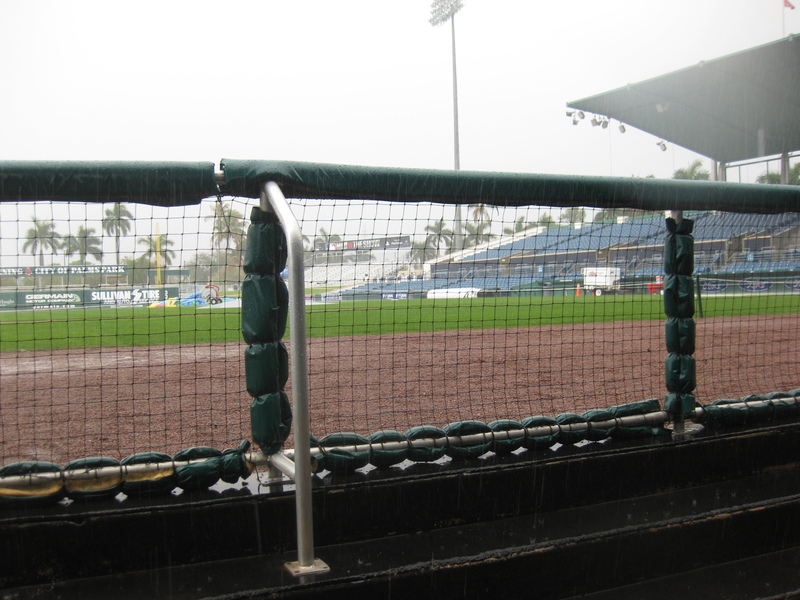 When you think of Spring Training, you normally think of warm, sunny Florida or Arizona, right? Well, that was certainly not the case today. It was cold and rainy, but as most of you know, that wasn’t going to stop me. My teeth were chattering the entire time, my lips were probably blue, but I didn’t care because there was no place on earth that I would have rather been. So we walked in, and I immediately recognized one of the security guards, John. 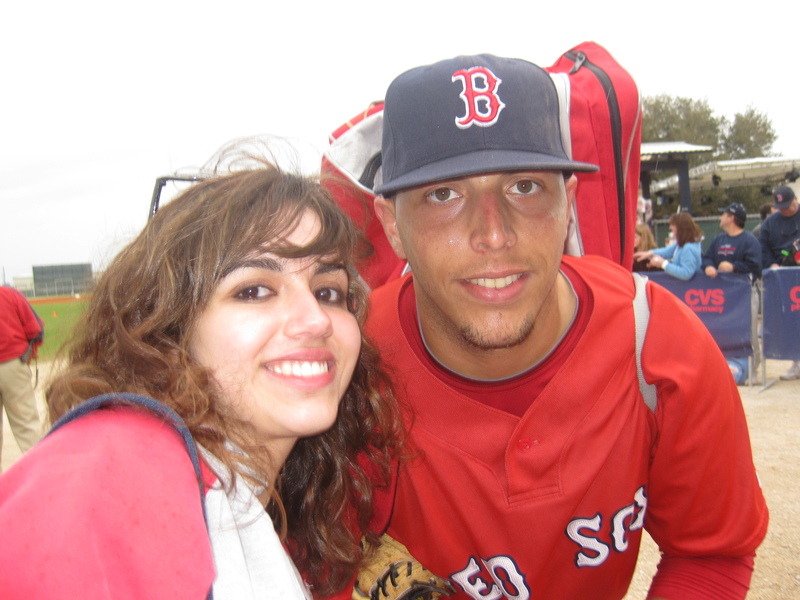 He had worked at Spring Training last season, and he is a security guard for the Pawtucket Red Sox. He’s a great guy! We got to talking a bit, and as we got on to the topic of Spring Training games, he mentioned that he had some extra tickets to games on April 1 and 2. They are the first row behind the dugout, and he offered them to us at face value. Not only that, but he also trusted us enough to send him a check because we didn’t have enough cash on us to cover both tickets. After that, I wandered around a bit to try and find the best spot for collecting autographs. It was very hard because unfortunately, I can’t be in three different places at once. 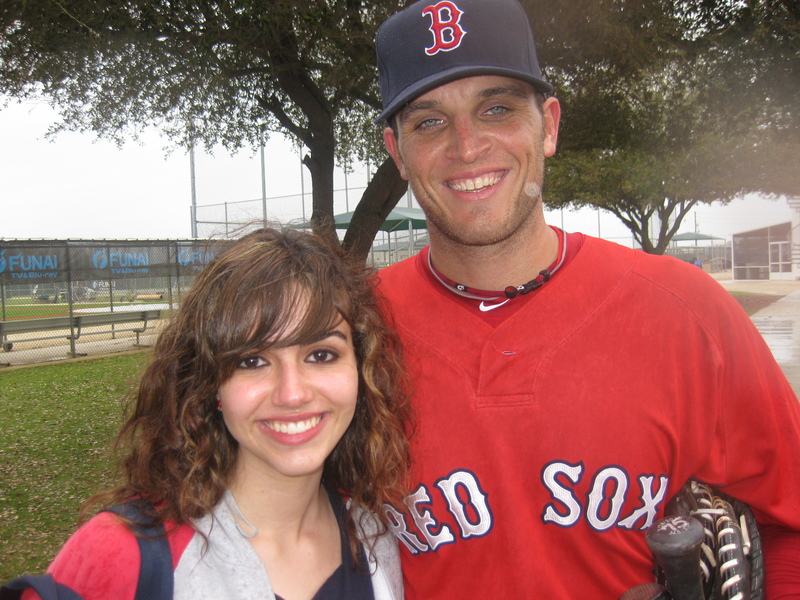 Unfortunately, guys like Dustin Pedroia, Jacoby Ellsbury, David Ortiz, Marco Scutaro, Adrian Beltre, and Jed Lowrie weren’t too into signing at that point. They went straight from the field to the cages, but I guess we remember that they have a job to do. So I moved to a small, uncrowded path between Fields 1 and 2. Perfect! All of the players had to walk to the other field at some point, so most of them stopped to sign. It all started as Ramon Ramirez (the one you’re familiar with, not the non-roster invitee) walked off the field. He quickly signed for me, as well as some of the people around me. I met an especially nice, young couple from MA, who had been living in the Ft. Myers area for the past few years, but were moving back soon. The woman was having the players sign her “Wally the Green Monster” book for her baby. Then, Daniel Bard came jogging along. He signed for a couple of people quickly, but had to move on. Adam Mills followed, a guy who I am very excited to watch this spring. Well, I let him know what I thought about him, and he certainly appreciated it. Not many people around me knew who he was though, so I was boasting about him as he was signing, and he had a big grin on his face. Hope was not lost for a photo with Daniel Bard. On his way out, he was kind enough to pose for a quick photo with me. He seems to be twice my height, much taller than I thought he would be. We watched Dustin Richardson throw some batting practice, and I told everyone how excited I was to see him pitch this spring. It was great that I was getting all of these pitchers’ autographs because I rarely have a chance during the actual games since the bullpen is hard to get to. Dustin Richardson jogged by despite my “You’re my favorite pitcher!” plea. I haven’t decided if he’s officially my favorite pitcher, but he’s certainly up there. He said he had to run, but that he would come back. I was determined to hold him to his word, but I was worried for a bit because a lot of the players were leaving through an alternative exit. Well as he finished up his drills, I called to him. He came right over, and I was able to tell him how much I enjoyed watching him during the spring last year, and how well he did during September, and how excited I was to see him this spring. He definitely appreciated it, and I gave him my card with the link to this site. 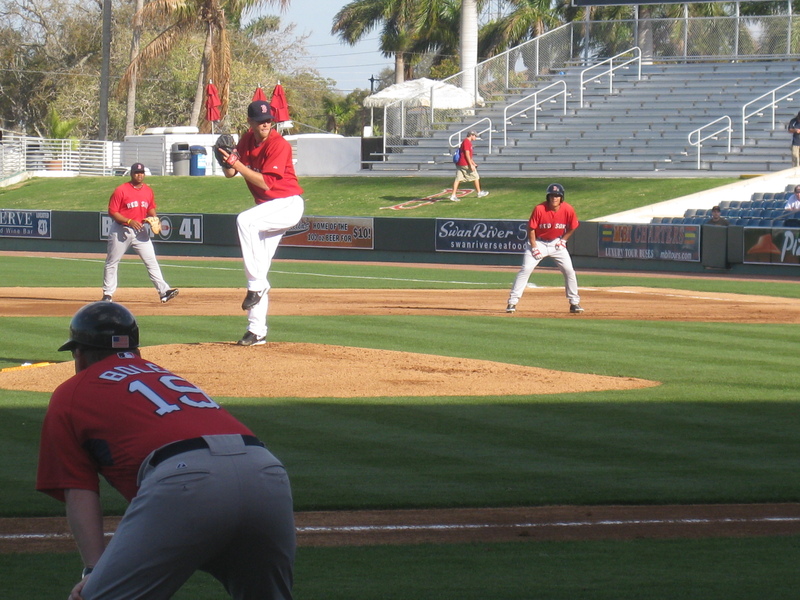 Then, the guys from Single-A and Double-AA who weren’t invited to spring training started warming up for their practice. I got autographs from some of them, and even a few pictures. Before their practice, they watched the big league guys practice. Hopefully they’ll be up there soon. ome of the big leaguers were signing on their way out. I ran over to Field 3, grabbed my Dustin Pedroia salsa, and stood in what was probably the most inconvenient spot possible. “Dustin, I have your salsa! !” I yelled. He looked over and chuckled, and that’s all that I needed. Then Victor Martinez started to walk out with his two, adorable children. He was kind enough to sign, but somehow managed to skip over my ball. The fence was so high, so it was hard to get a good angle. Autographs are much better when you can see the player’s face anyway. 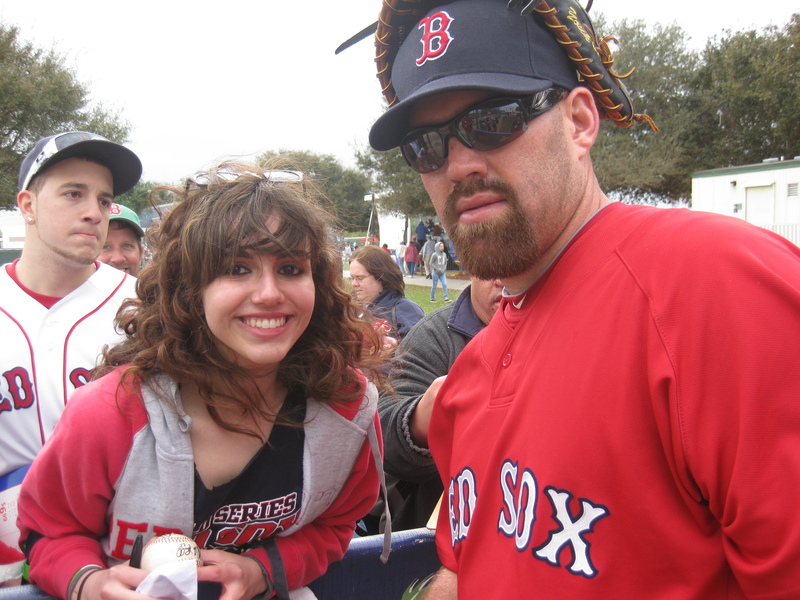 I gave up on that endeavor when I noticed that Kevin Youkilis was signing. I wasn’t going to miss this opportunity, so I ran over to what I think was Field 4, and patiently waited. He was great about signing! Not only did he sign for me, but he also posed for a picture! I walked over to the area outside of Field 2, and I managed to snag Luis Exposito’s signature on his way out. He has promised me before, so he kept his word as well! Then, I noticed that Lars Anderson, Zach Daeges, and a few other guys were standing in a circle talking. I asked them to come around the fence for a second to chat, and they obliged. Lars said that he liked my glasses, I told him that he could have them, but he said they looked better on me. He was happy to wear them for the picture though. 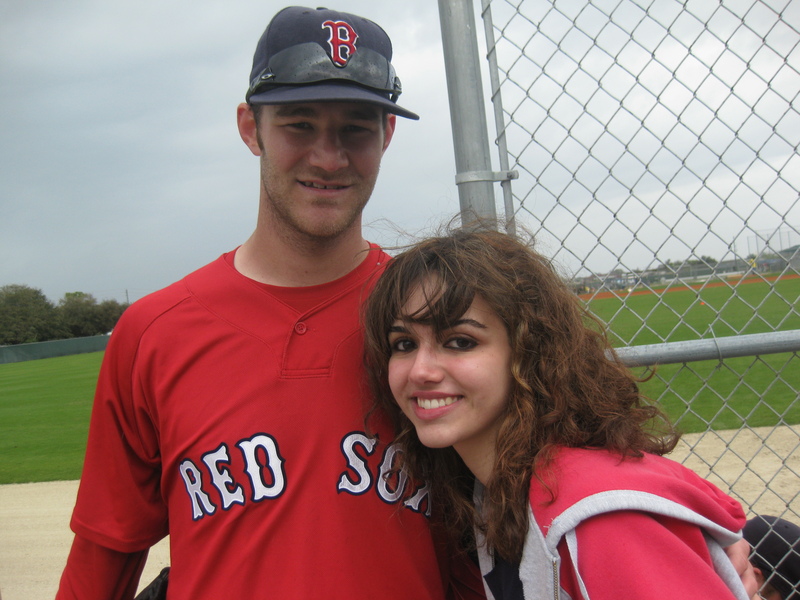 Zach Daeges remembered me from when I last met him, and he said that he was real excited to start the season. He had yet to check out this site though, even after I informally interviewed him! It seemed like it was over after that, but it was a good thing we stayed because a few more players were coming out. I was able to catch some of Josh Reddick’s batting practice, and he said he would meet me at the bleachers afterwards to sign and talk for a bit. Meanwhile, I was able to catch Tug Hutlett, Gil Velazquez and Aaron Bates on their way out. Tug said I deserved an autograph for waiting in the rain. Perhaps my favorite conversation was the one I had with Josh. For some reason, I remember his very first at-bat during Spring Training of last season, so I asked if he remembered it. We talked about it, and I told him that I knew that he was going to be my project just from watching that at-bat. He seemed to enjoy that, and I also gave him my card. Practice seemed to be over for the day, so we hopped on the bus back to City of Palms Park to see what was going on. Most of the activities were cancelled because of the rain, but it was mostly stuff for the little kids anyway. Then again, I’d go in a bounce house if one of the players went with me. We were allowed to check out the dugouts though, so I thought that would be pretty cool. I didn’t stop at just the dugout though. I noticed the little path that leads to the clubhouse, and so I decided to check it out. It’s not my fault if people leave doors open. 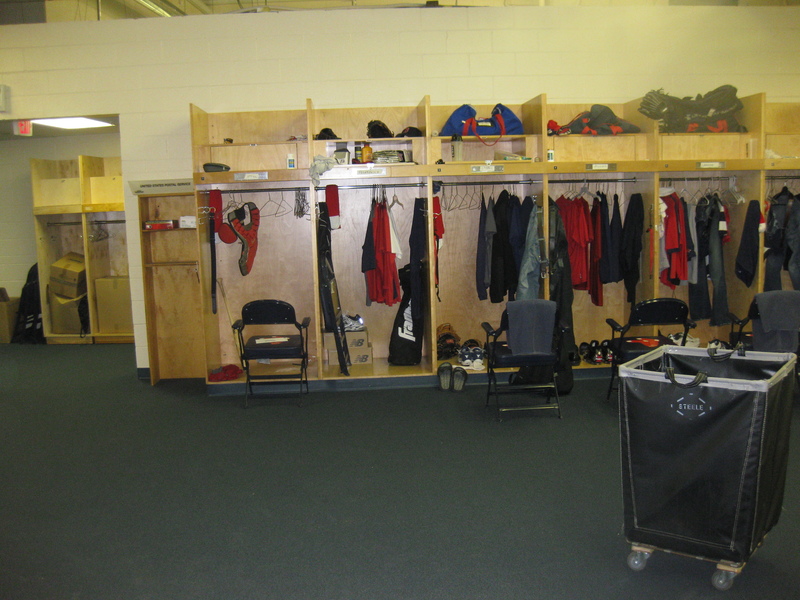 That’s right folks, I went inside the Red Sox clubhouse. The clubhouse: the final frontier. Well, that frontier didn’t last very long. The clubhouse guy, Sgt, (he used to be in the military) asked me to leave, but he let me take a quick picture. I was thinking about leaving until I saw a long line of people. 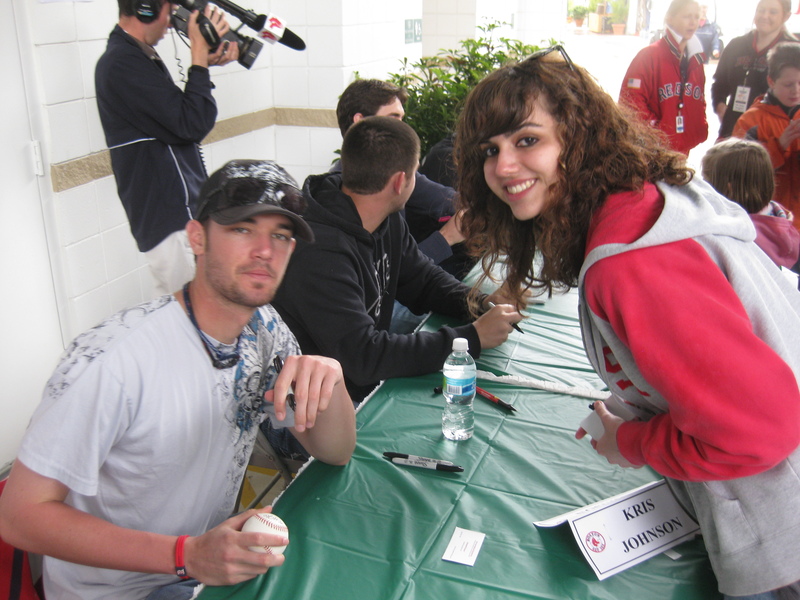 They were waiting for Kris Johnson, Casey Kelly, Kyle Weiland, and Ryan Kalish. It took a while for things to get started, and apparently we weren’t allowed to pose for photos. Really? I had just snuck into the clubhouse; I could easily get a photo. These were actually the most amusing guys of the day. 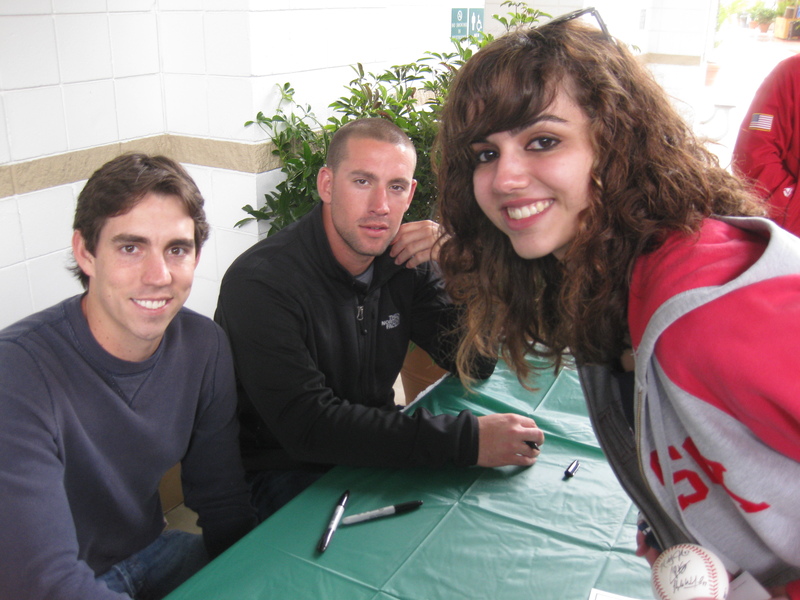 They signed my baseball (a new one, because I filled my others and the hat up) and smiled for pictures. I gave them the link to my blog and Kris Johnson said, “What is this? Are you writing good things about me?” “Yes, yes of course!” I said. “Oh that’s what they all say,” Kalish said jokingly. Well, if they do end up checking it out, then they’ll see all the nice things that I say about them. It was real nice meeting them, but they were the only autographers for the event. 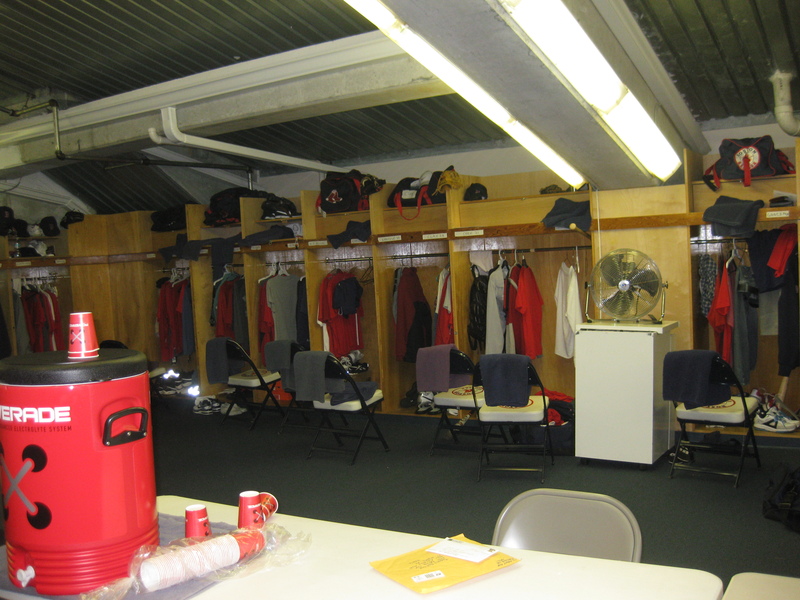 I went back down to the field and decided to check out the visitor’s clubhouse, and to see which doors were open down there. Sgt. was there again! We actually talked for a bit, and he let me stay for a bit longer that time. I have officially been in both clubhouses. Then we started talking to this really nice security guard, Tom. 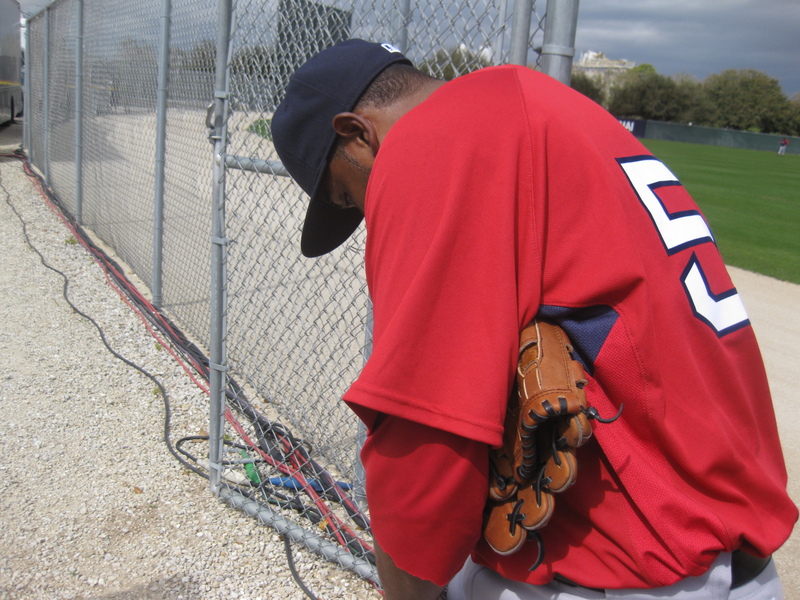 He showed us the bullpen area, and he mentioned that I should try and get a press pass for Spring Training. I’m definitely going to get on that. You see, I don’t just want it as a fan, or anything like that. I’m really serious about this. Then we saw those Single-A and Double-AA guys, and I spotted Ryan Westmoreland, or rather, he spotted me. He waved to me, so I went down and talked to him for a second. He was real nice! As we were getting ready to go, I spotted Ryan Kalish and Casey Kelly walking around with some italian ices. I stopped them to talk to them. “Kris was looking for you…” Casey said. “You spelled analysis wrong on your card”. “Analyses is the plural of analysis!” I said. “Can you please tell him that? Make sure he knows!” Kelly promised me he would, but then I got to talking to him a little longer, and he was really down to earth. “How was it deciding between being a shortstop and a pitcher?” I wanted to hear it from him. He said it was easy once he sat down with the guys and talked about it. They said he would rise faster as a pitcher, so it was easy from there. I asked him if he knew when he was going to be starting during the Spring, but he didn’t. I asked him to start on Saturdays though so that I could see him, and he said that he would ask the organization if he could start on Saturdays for me. Well folks, that was the day! I hope that you were able to live vicariously through me, and I hope that my words were able to bring my experience to life–at least to an extent. I know that many of you live up North, so I hope that I can be your vehicle to Spring Training. You can read the recaps and the story lines, but this is one of the only places where you’ll get the true experience of the spring. I’ll end this entry by quoting Star Trek: These are my voyages. My ongoing mission: to boldly go to strange new worlds (the clubhouse), to seek out new life-forms (discover prospects) and new civilizations (? ); to boldly go where no one has gone before. The minute that my exam finished, I was so happy. The main reason being that I could finally get back to watching baseball. The fact that the Red Sox won the night before my exam, and the night of, really helps seal the deal for me. I mean, besides the fact that I forgot to mention the cotton gin in my DBQ (about the expansion of slavery), I think I did fine. Plus, the Sox finally won a series against the Rays. That took long enough. In a way, I miss the days where we could walk all over them, but in another sense, I do like the rivalry… a lot. Jason Varitek has been getting some nice, key hits, and it’s not like I need to mention Mr. Clutch-hitter (Jason Bay). You know, I’m sure he did this in Pittsburgh all the time, but with the whole media attention thing, I guess it went unnoticed. The Red Sox also did what they finally needed to do–letting Javier Lopez go. 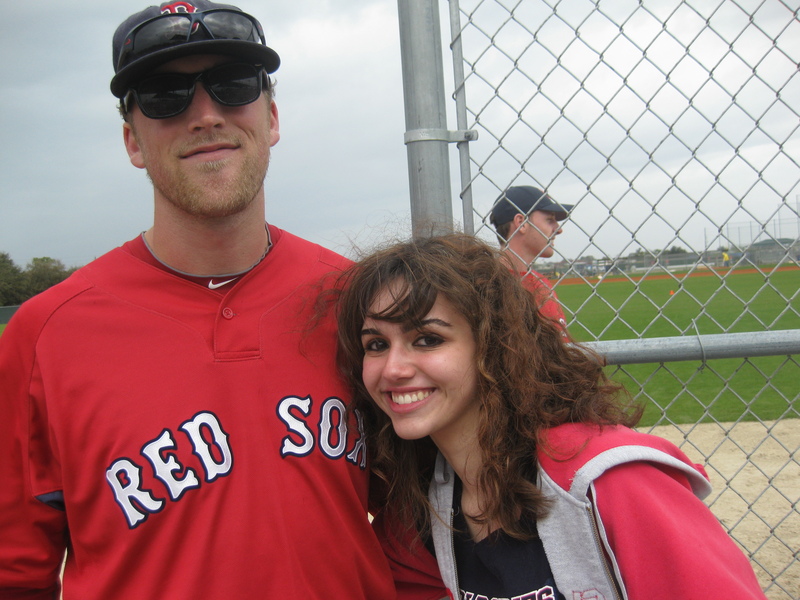 That guy has given me heart attacks ever since he came to the Red Sox, and this year it has gotten even worse. Every time he came in this year, it was basically saying, ‘We concede to you,’. Whether it be the various errors that result in walk-off wins, or maybe just blowing leads, it was time to go. This is the best thing the Red Sox have done since reacquiring Kason Gabbard (yeah, they do good things often). The bullpen is basically impeccable now. I am confident with everyone in there, even though Papelbon has been having a bit of a “flair for the dramatic” lately. Okay, I just lied… I’m not AS comfortable with Hunter Jones (maybe because I didn’t see him much during spring training), but he’s done alright. I was happy that the Sox brought up Daniel Bard. You guys should have seen him in spring training. He has a 100 mph fastball and posted a 0.00 ERA during spring training, and his stats aren’t half bad down in Triple AAA Pawtucket either. 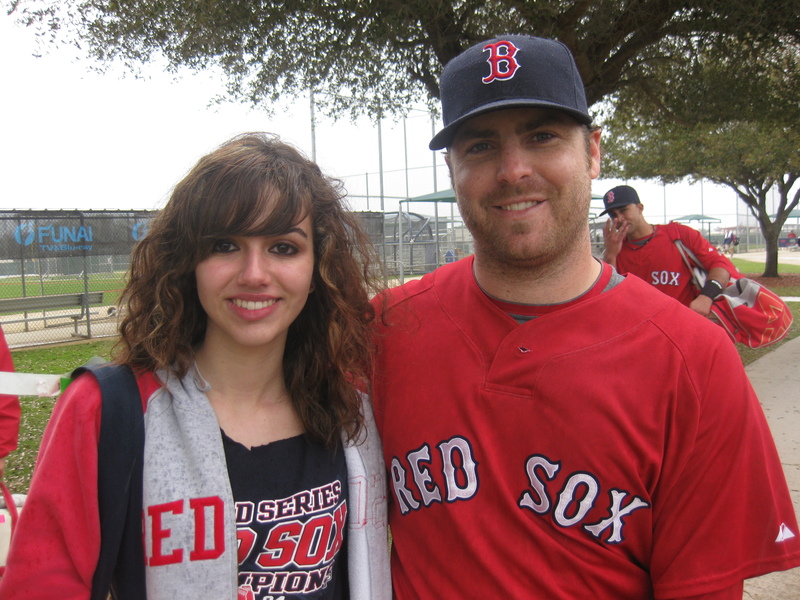 Speaking of which, I’m planning on visiting the PawSox this summer. I cannot wait. I didn’t even drink coffee to keep myself up for the West Coast game last night. I had taken a two hour nap (and thus, avoided homework) and was pretty much ready to go. Justin Masterson was all over the place, but his quote was so funny “A ball here, a ball there, a strike every once and a while”. So his control was a bit off, but he did manage to only give up two runs. I really thought that I was in for it when the Red Sox tied it at 3. I was hoping it wouldn’t be too late of a night, because I was still pretty tired. Luckily, Jason Varitek came through with a single, and Pap was to come in to close the ninth. This one was not as dramatic as the Mother’s Day save where he put two men on (who then advanced to second and third) and then struck the next three guys out. It was pretty epic. This one ended in a less dramatic fashion, but with the same results. And a special shout out to Dom Dimaggio who passed away not so long ago. 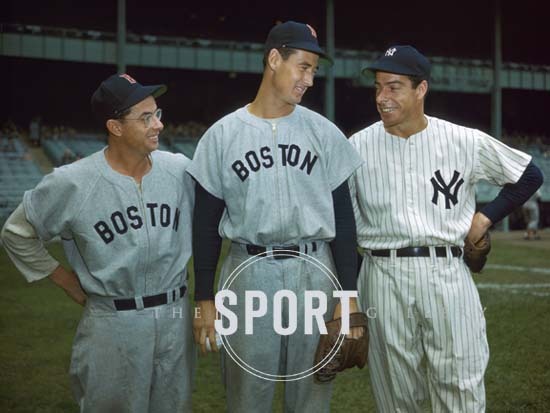 He was probably one of the most underrated players ever, but when your brother is Joe Dimaggio and your teammate is Ted Williams, what can you expect? I love the fact that he was called the “little professor” on the team. 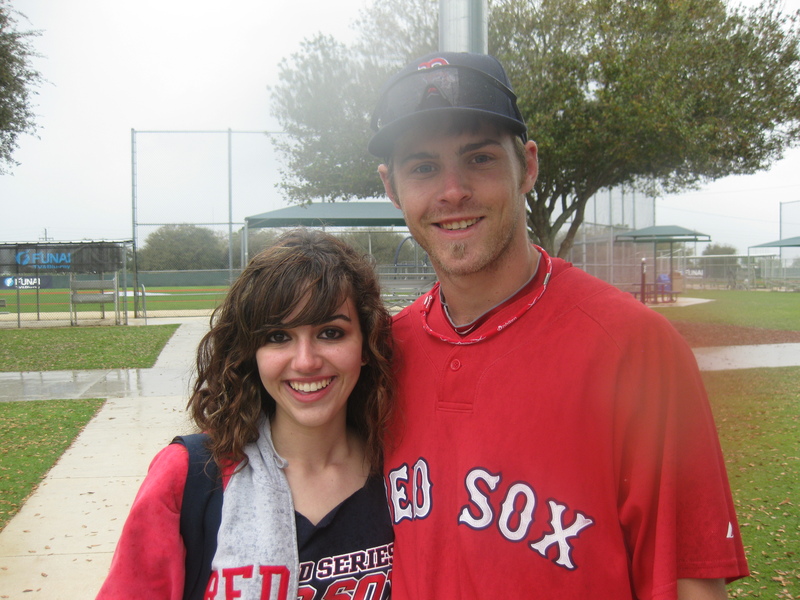 Dustin Pedroia kind of reminds me of him (or his build at least). 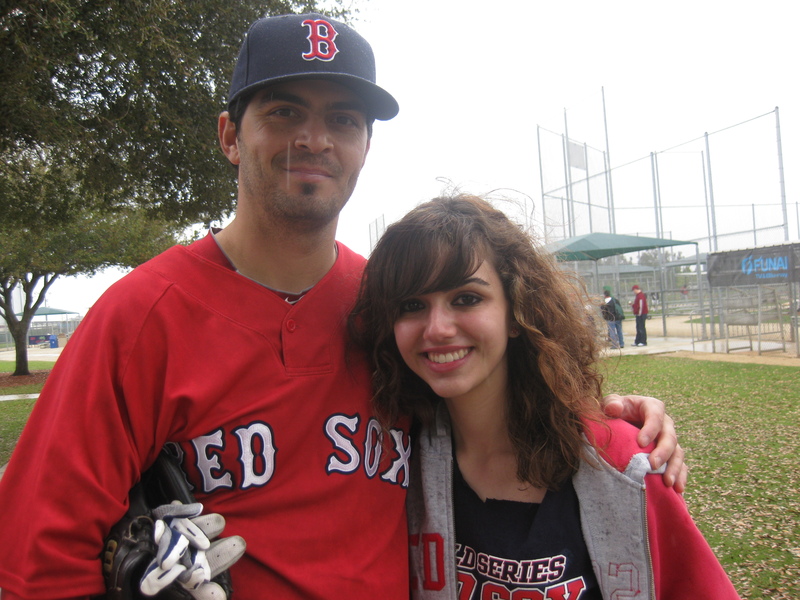 Dom also holds the longest hitting streak in Red Sox history at 34 games. 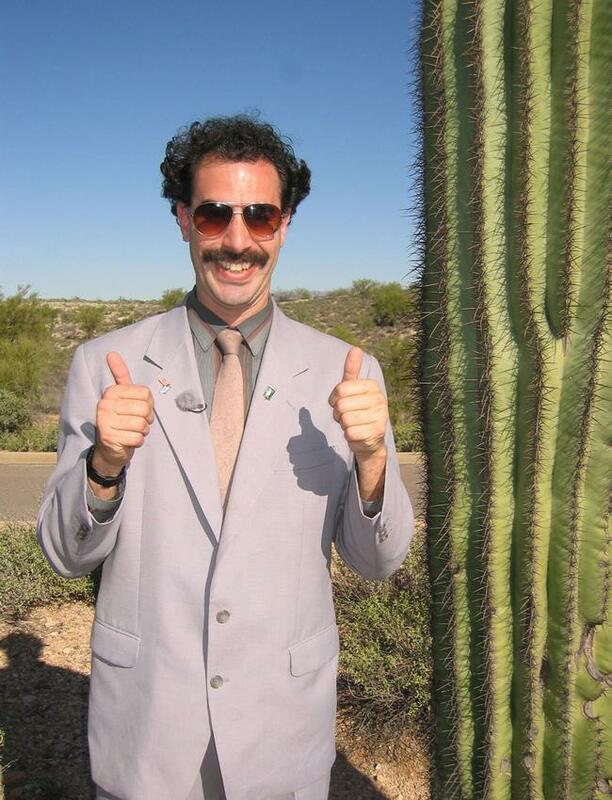 Ryan Zimmerman and his hitting streak, that’s gotta be great for the miserable Nats (no offense). But in all honesty, I don’t think he’ll catch Dimaggio. That record is going to last a long time. The ERAs under one? Zack Grienke and Johan Santana? I have basically awarded the Cy Young to the two of them already. And by the way, I’m not concerned with the lackluster performances that some of the Red Sox starters have been having because honestly, it’s pretty much been limited to one inning. If I remember correctly, Jon Lester started out (2-3) last season as well. And then he turned into “one of the best left handed pitchers in the game). And I would be remiss if I did not mention Albert Pujols. I think that he has the potential to win the Triple Crown. But how cool would it be if a Red Sox won it? Not because they’re my favorite team, but because the last person to win it was a Red Sox, in 1967…. Mr. Carl Yastrzemski. By the way, I think Yastrzemski should be a spelling bee word, it’s impossible to spell. I guess I could just give you guys the same predictions that everyone else has… but I don’t really want to do that. I’m going to break down each position, and briefly look at every player. Tonight, I want to look at pitching. I’ll tell you guys how I think their 2009 season will be, and what they will need to do to either come over the 2008 woes, or maintain their 2008 heights. Starting Pitching: This year, the Red Sox have some familiar faces in the first four slots for the rotation. The only thing that is different is their fifth spot– they didn’t just hand it over to Clay Buchholz like they did last year (not that they had much of a choice). 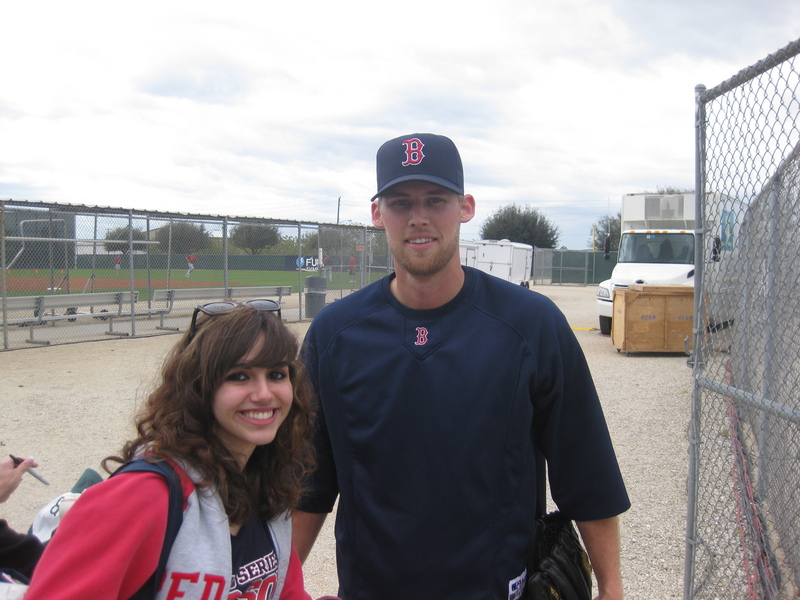 In fact, despite an impressive spring, Clay won’t even be starting the season with the Red Sox! During the offseason, the Red Sox picked up Brad Penny and John Smoltz. Sure Brad Penny is no CC Sabbathia, but he can sure matchup with AJ Burnett pretty well. And John Smoltz may not be in the prime of his career, but I think that he has some words of wisdom that he can pass down to the guys. Justin Masterson could have filled the fifth starting spot very nicely, but I’ll tell you guys why I think he’ll work out very nicely in the bullpen. Josh Beckett: We all know that Beckett has the stuff that can put him in the realm of the most dominant pitchers in baseball, but whenever he is injured, he spends so much time recovering, that he isn’t really that dominant. Luckily, Beckett will be starting the season with the Red Sox, and Opening Day for that matter. In 2007 he went 20-7, and in 2008 he went 12-10. So what happened? I agree with the people who have said that he was catching up to himself that entire year. He got injured during Spring Training so he didn’t have a lot of time to get into his rhythm. When he was ready to return, he was thrown right out into a high pressure atmosphere. Guys need Spring Training… just look at Jake Peavy! Jon Lester: Lester’s comeback from cancer story is really nice and inspiring and all, but honestly, it’s time to get over it, and he thinks so too. He has said that he wants to be known as a pitcher, not the kid that came back from cancer. Nonetheless, every time he pitches I’m sure we’ll be hearing the story. Anyway, we saw what this guy could do in 2008, his stuff is lethal. Not to mention the fact that he has added a changeup to his arsenal, and oh yeah his performance in the playoffs. There are two things that he needs to remember, and that we need to remember about him. 1. He cannot get overconfident with himself. In the ALCS, everyone had penciled him in for a win because of his performance in the ALDS. I think we let ourselves get a little to confident, and I think he got a little too confident. He needs to focus on executing his pitches, not the fact that statistically, he will probably win this game. 2. He is still really young, so he is still growing. We can’t expect him to be perfect. He’s going to go through some ups and downs. Luckily, he has got Jason Varitek behind the plate, and John Smoltz for some guidance. Daisuke Matsuzaka: Dice-K obviously performed really well last year: going 18-3 with an ERA under 3.00. The thing is, he wouldn’t usually go that deep. And the reason that he wouldn’t go that deep: walks. I know that he has a remarkable ability to get out of jams (that he creates with his walks), but I would much rather him try to impress me by going into the seventh inning more often. When he would only go five innings last year, that would put extra stress on our not so deep bullpen. This year, if he can go a bit deeper, and put not so much stress on our much deeper bullpen… well, wouldn’t that be a lot better? Tim Wakefield: Everything is better at 62 mph right? Well, that is until the batters time down the knuckle ball and start hitting it all over the place. The good thing about Wakefield is that he can go pretty deep into games. The uncertain part is that he is either on or off… there is very little middle ground. Some nights he’ll have great command, and other nights it’s just not there. Still, it is really fun to watch Wakefield baffle hitters with that knuckleball. Brad Penny: The fact that he was 6-9 last year definitely reduced his free agent worth. On the other hand, in 2007 he went 16-4. AJ Burnett on the other hand was one of the must valuable free agents out there. Yet if you compare their numbers, I’d consider them equals. John Smoltz: I honestly am not really sure as to how John Smoltz’s numbers will be this season. His role is obviously quite similar to what Curt Schilling’s was supposed to be last season. So where the heck is he going to fit into the rotation when he returns in June? Good question, because I have the same one. I don’t think that the Red Sox would put him or Brad Penny in the bullpen because they could both serve very effectively as starters. So could the Red Sox have a six man rotation? This could work out very well when various injuries start happening throughout the season. Bullpen: Last year, the bullpen tended to be a problem for the Red Sox. This year, it could be what makes the difference in October. With some very nice additions this bullpen could be considered one of the best in baseball. Manny Delcarmen: This guy definitely improved last year, and I think I had under appreciated him in past years. Last year, he appeared in 73 games (74 innings) with a 3.74 ERA. I don’t really consider him a set up man, but I love having him as a true middle reliever. Javier Lopez: He is another one of those guys that is either totally on or totally off. So sometimes, I start pacing my living room when he comes in. I see him come in for only one batter a lot, but that’s because he is a lefty specialist. He pitched great in the World Baseball Classic, and I think I underrate him too because his highest ERA in a Boston uniform is 3.10. Justin Masterson: I am so excited to have him here for Opening Day! Last year, he showed us that he can be effective both as a starter and a reliever. So why isn’t he starting then? If he gets the fifth slot, than where would we put Brad Penny? Brad obviously has more experience as a starter, and Justin honestly makes a difference in that bullpen. In the postseason, I loved having either Okajima-Masteron-Papelbon, or Masterson-Okajima-Papelbon. I think he’ll have a really nice year in the bullpen. Hideki Okajima: Although Okajima was not as consistent last year as he was in 2007, he still did pretty well. Like I’ve said, inconsistency is bound to happen, and I still think that he can be really effective this year. The good part is, we won’t have to rely on him that much seeing that we picked up Ramon Ramirez and Takashi Saito. iced this spring, he just needs to maintain his command. The biggest thing will be the transition from Kansas City to Boston. There is always a lot more scrutiny and attention in places like Boston, New York, and Philadelphia, but as long as he stays focused, I’m not concerned. Takashi Saito: So this guy posted some pretty spectacular numbers as a closer for the Dodgers, and now he’s coming to the Red Sox just as a set-up man? That’s pretty awesome. But I think that we can still use him to close some games–in fact, I think that we should. At the end of last season… the very end, I’m talking Game 7 of the ALCS… Papelbon wasn’t even available to pitch. He was worn out, and I think we used him way too much throughout the entire season. I’m not saying that he and Saito should split time, but if Papelbon has been working a lot, I think that Saito is definitely qualified to close out a game. Jonathan Papelbon: We all know that Papelbon is a very dominant guy, but he did blow a few saves last season. In fact, he blew two in a row. I remember thinking that he needed some rest! We work this poor guy to death (not that we had any other option). But now, I feel much more comfortable that we have guys that will be able to fill in when he needs an off day. Papelbon obviously has a great mentality, so he definitely needs to maintain that, and if he does, I think that he will have a great season. 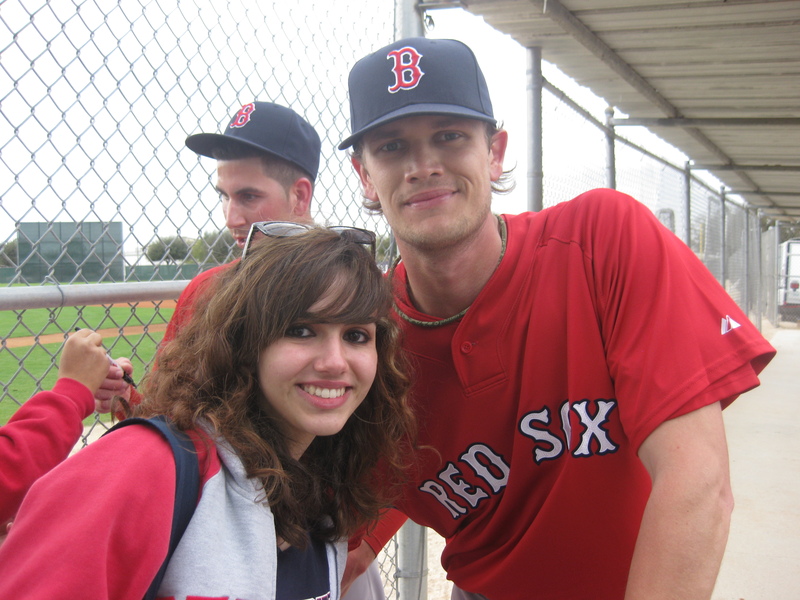 Keep your eyes open for: Clay Buchholz, Michael Bowden, and Daniel Bard. I think that we will see all of them throughout the entire season. Also, keep tabs on Junichi Tazawa’s progress. Offensive/Defensive preview to come either late tomorrow, or early Monday! !